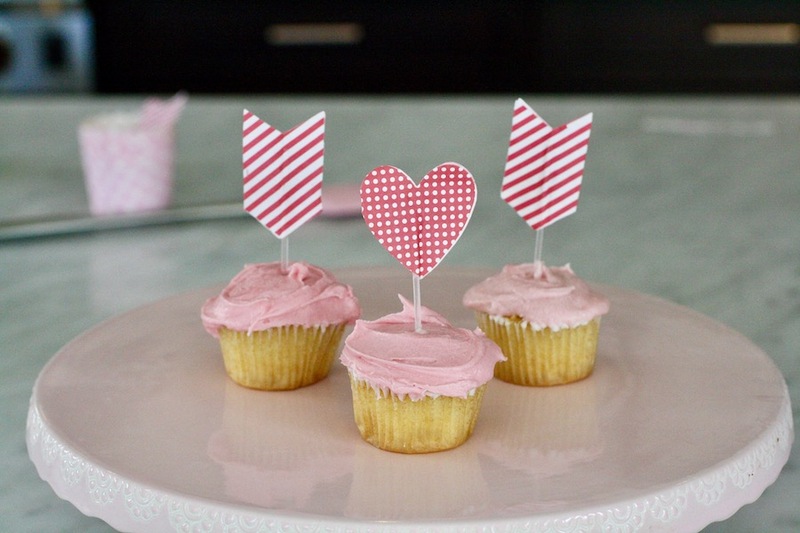 For this Valentine’s Day, I thought it would be fun to learn how to make natural pink frosting for cakes and cupcakes. 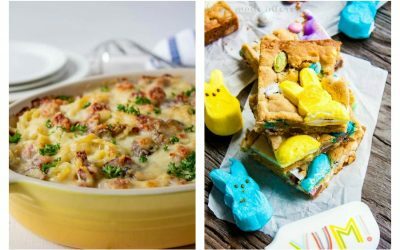 My kids are at the age where they love the baking process almost (almost) as much as the finished treat, and our recent binging of Netflix’s Nailed It has just made them even more excited to experiment with different flavors and colors. 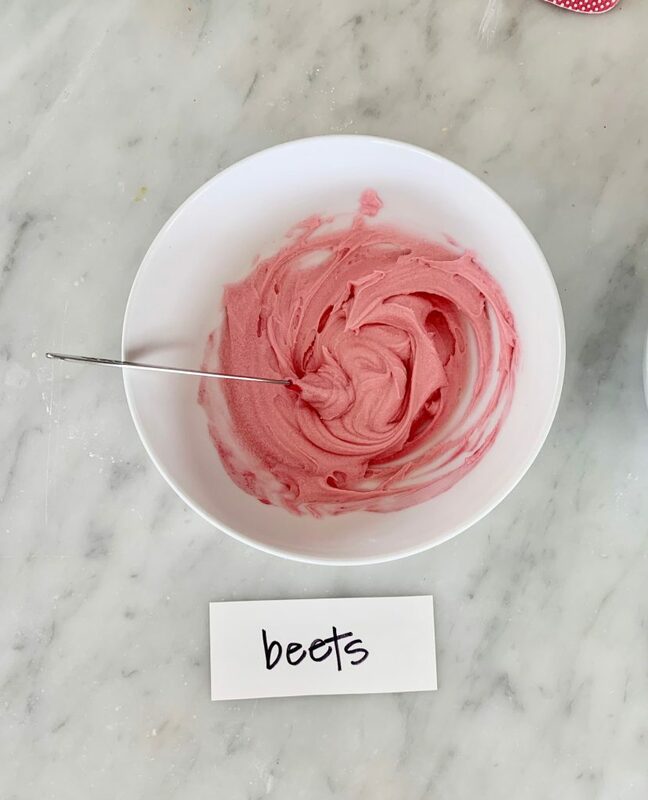 So we sat down and tried a delicious experiment: Testing out 3 popular methods for making natural pink frosting, and seeing how they all come out. Now to be honest, I’m not a mom who’s totally adverse to food dye (and we don’t have any sensitivities in our family), but I have noticed that dyes like red # 40 are becoming a little too ubiquitous for my taste — I even found it as an ingredient in a peanut butter snack item recently. Whoa. That said, I know that using more natural pink frosting — or swapping natural food dyes into whatever recipe calls for food coloring — is not only healthier for our bodies, it’s also surprisingly easy. And it may make you feel just the teensiest bit better about downing that second pink frosted cupcake. 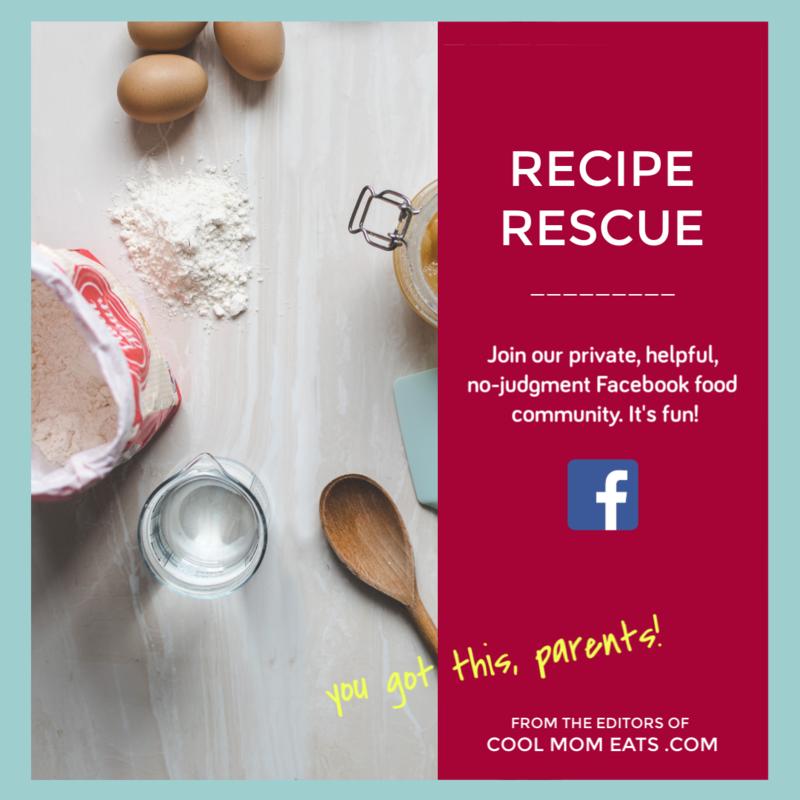 The basic idea is that you’ll be using the juice or cooking liquid of vibrant colored produce to create natural pink frosting colors, from your favorite white frosting. I started with a base of basic buttercream frosting made with a stick of butter and powdered sugar. I suggest you err on the side of of adding less milk than more when making your frosting, since you’ll be adding more liquid to your frosting than you might with a few drops of artificial food dyes. 1. Peel two beets and cut them into pieces. Since beets can stain hands and counters, this is a grown-up (or teen) job. 2. 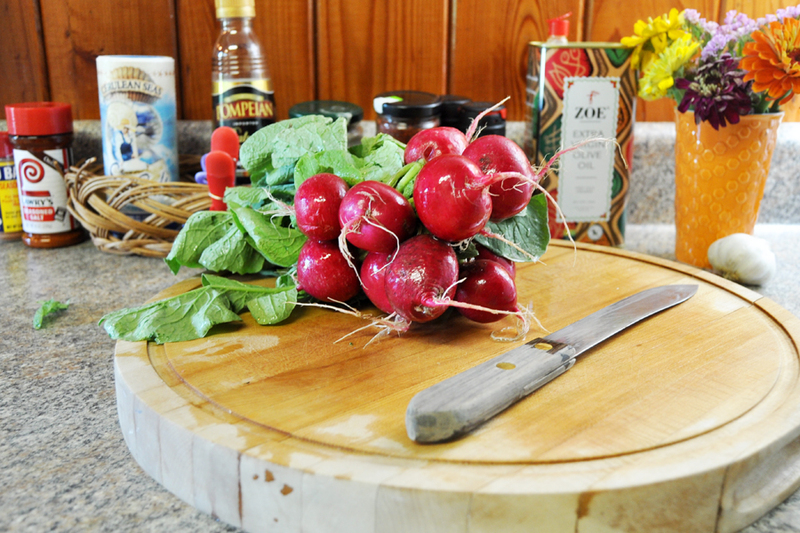 Place the beets in a small saucepan and cover with water. 3. Simmer beets until cooked through and liquid is reduced by half. 4. 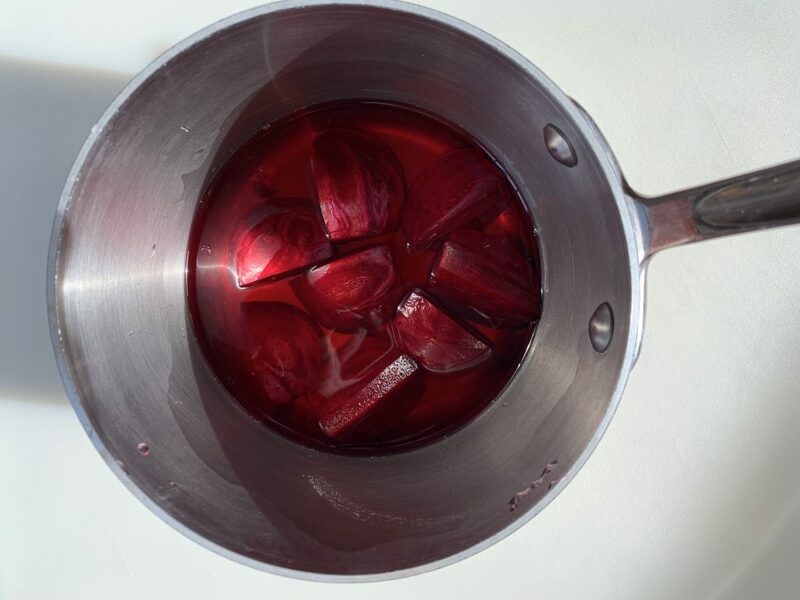 Remove beets and let liquid cool to room temperature. 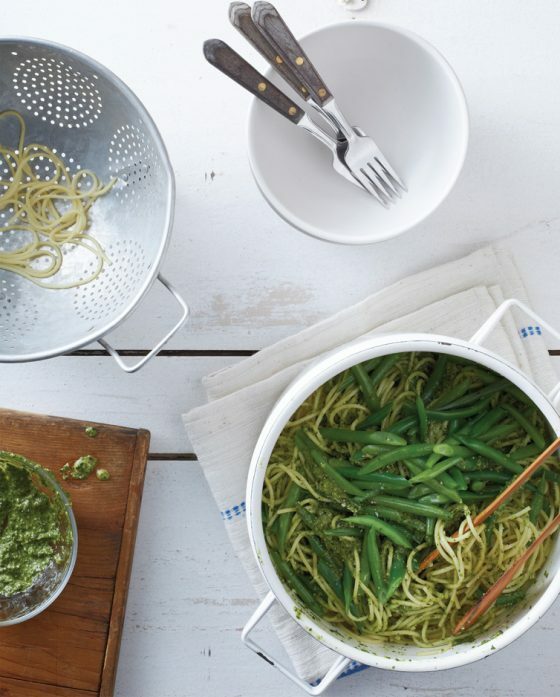 To speed things up, you can pour liquid into a small bowl and place in the fridge to get it to room temperature — not fridge temperature. 5. Stir into frosting, adding more until desired color is achieved. 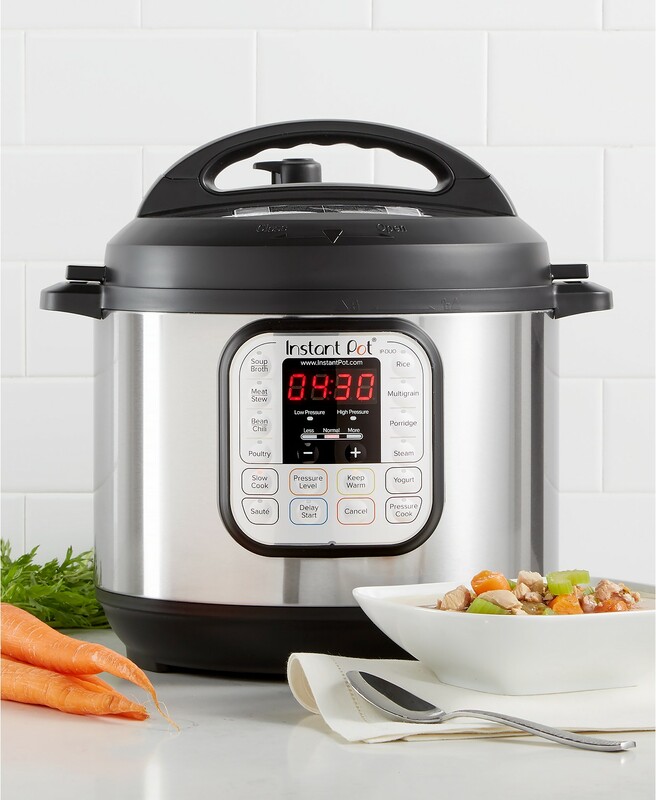 Tip: If you’d rather not peel and simmer the beets (it really is easy though, I promise!) you can purchase beet powder. This will give you a nice, vivid pink – about a tablespoon should do it. Add after you’ve mixed in your milk or cream. 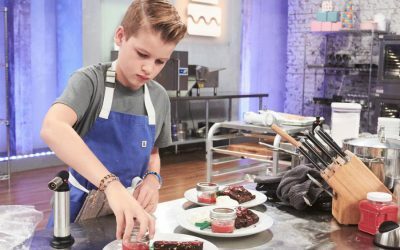 Result: We loved using the beets! The color was beautiful and a little goes a long way. 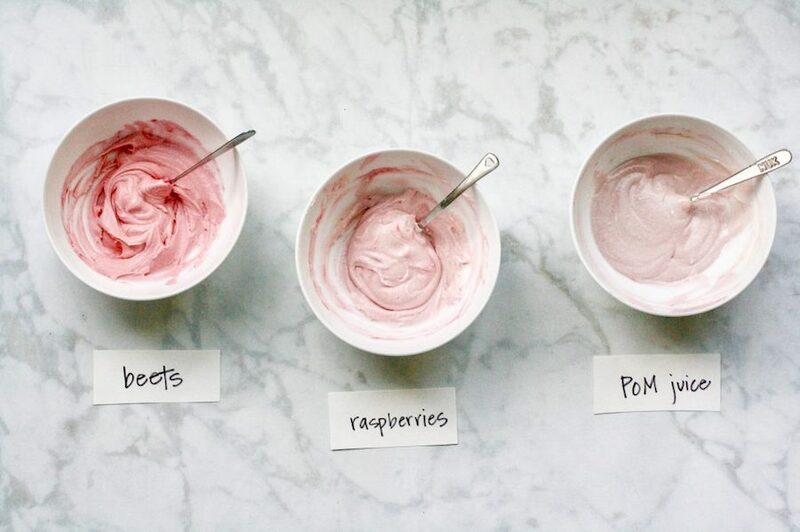 It’s easy to go from a subtle to brighter pink without tasting any beet flavor. My husband is the biggest beet-hater out there and even he couldn’t tell. 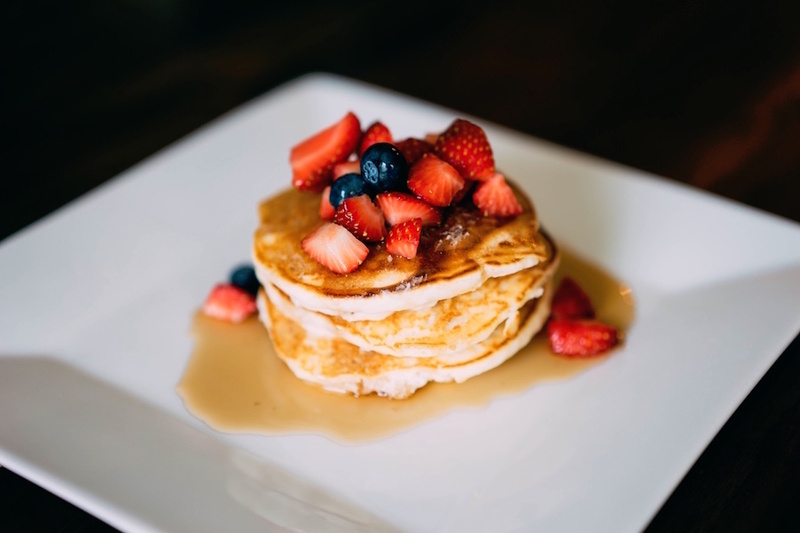 Related: Delicious Valentine’s Day treats made with fruit (that won’t cost you your child’s love). 1. 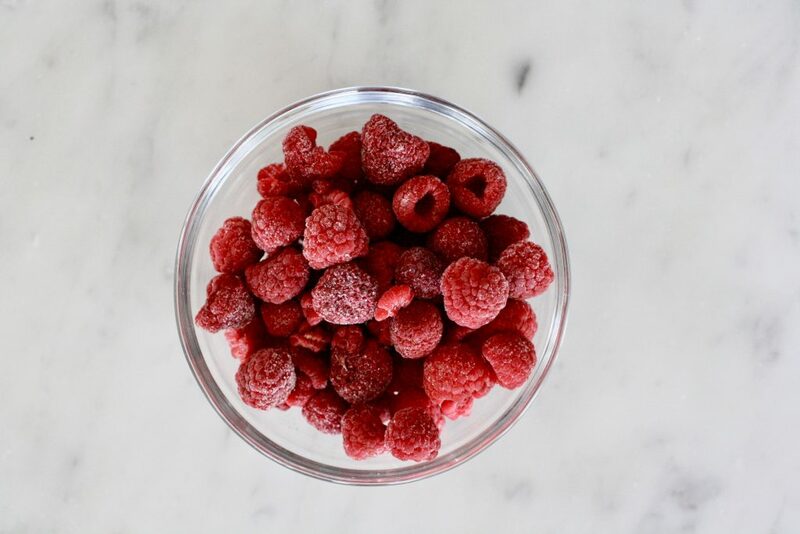 Microwave 1 cup frozen raspberries until thawed and really soft, about 1 to 2 minutes, stirring every 30 seconds. 2. 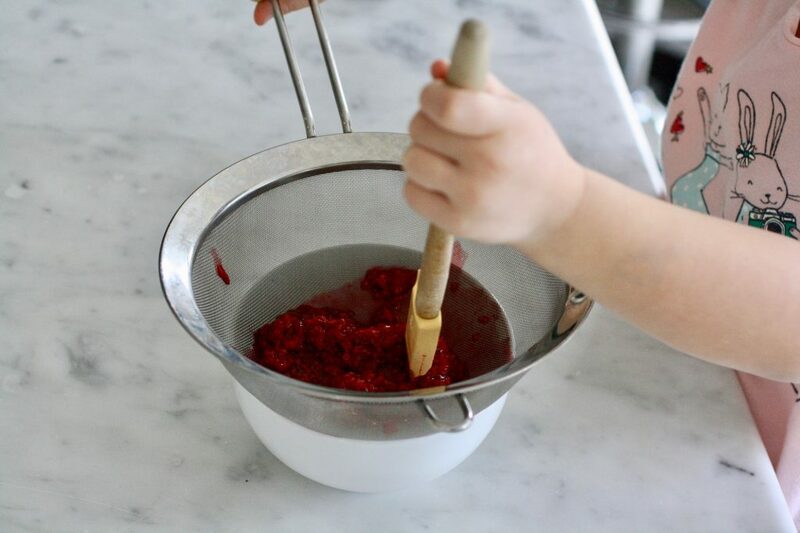 Strain the raspberries with a fine mesh strainer over a bowl, using a spatula to press the raspberries against the strainer, as seen above. 3. Reserve the liquid and let cool to room temperature. 4.Stir into frosting, adding a teaspoon at a time until desired color is achieved. 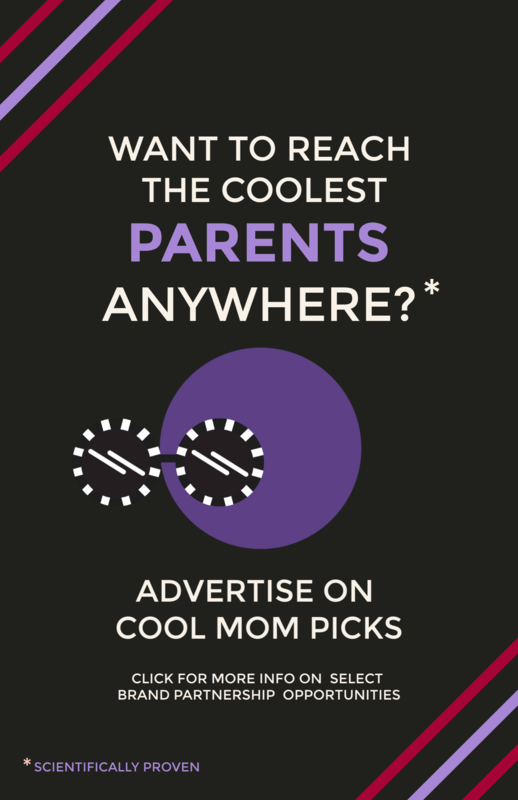 Result: This is the easiest method, and one that my young kids could manage on their own. Knowing the puree still had a little liquid in it, we added just a teaspoon at a time. It produced a pretty pink when fully mixed, but I also loved how it looked when just lightly swirled in, creating a lovely pink ombre effect. The frosting will have a notable raspberry taste, which I loved, but it’s something to consider. Interestingly, my kids still thought the neutral-tasting beet dye was better. Related: How to make a strawberry rose for Valentine’s Day – and any day that needs a little more pretty. 1. Add POM juice, a teaspoon at a time, directly to the frosting. 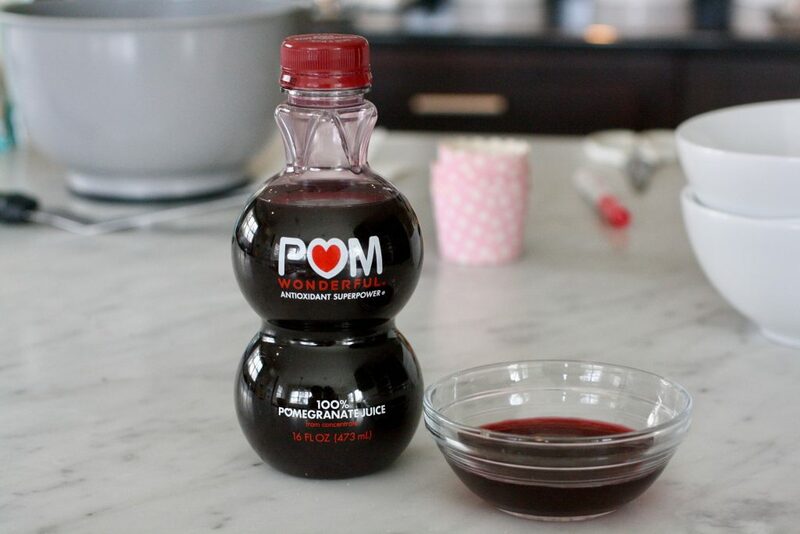 Tip: Against my culinary intuition, I did not reduce the POM juice before adding it. I knew reducing the liquid would concentrate the color and remove a lot of the water which would be better for frosting consistency — but I also knew it would concentrate the strong pomegranate flavor, which we weren’t crazy about. If you love pomegranate flavor though, this is an easy method. Just make sure to simmer the juice and reduce to a few tablespoons, then let cool.You could even garnish with some pretty pomegranate seeds. Result: A noble (lazy?) attempt, but our least favorite. 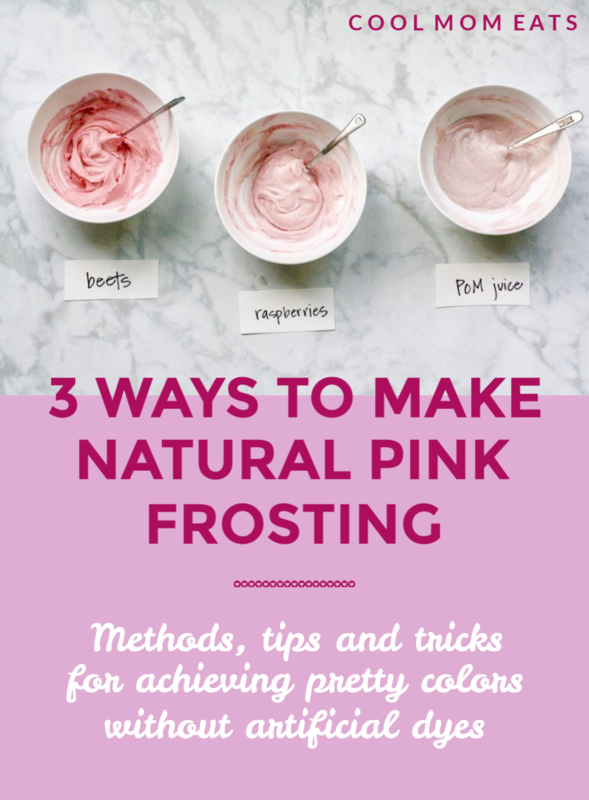 Since the juice is thin, we could only add a small amount to our frosting, which resulted in the lightest color of natural pink frosting of the three methods, by far. 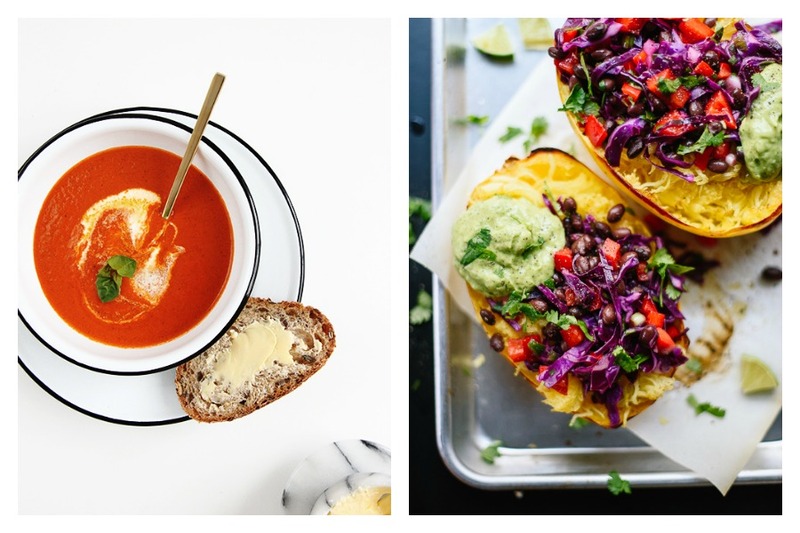 As for us, we’ll be making our Valentine frosting with beets or raspberry puree. We only tested our natural pink dyes on frosting, which we used to decorate mini store-bought cupcakes because, well, deadlines and dishes. But I know the beet dye would also work with royal icing. So go ahead and give it a try this Valentine’s Day or for your next party or bake sale. 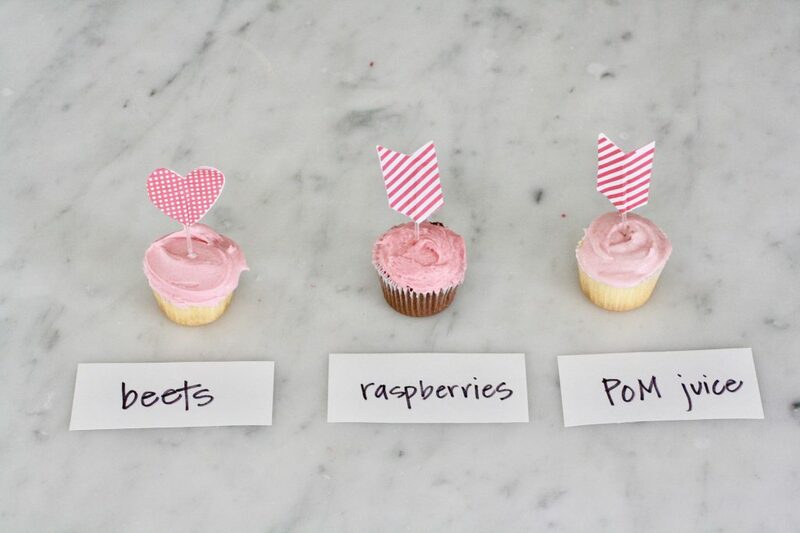 If anything, trying out natural pink frosting is a fun activity to share with your kids – and what’s sweeter than that? Another option is to blitz freeze dried strawberries or raspberries with the powdered sugar in a food processor, then make the buttercream. Nice alternative to food colouring. Even as a kid I felt food colouring was more than a little icky. 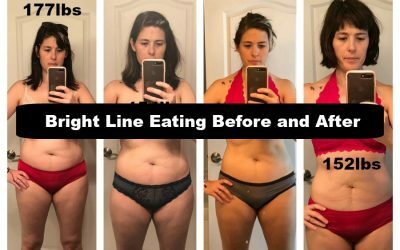 You should be able to use blueberries or blackberries the same way I’m thinking?